I am so excited to start reading in the book of Matthew with you today! Once again, Courtney Joseph over at Women Living Well, home of Good Morning Girls, has generously provided for us a free Bible bookmark and SOAK study guide for Matthew. In our reading of Matthew chapter 1 today, we find 4 unlikely women in Jesus' family tree from the genealogy listing found in verses 1-17. We see the beauty of God's grace in the fact that these 4 unlikely women are included in the genealogy of Jesus by Matthew, who was inspired by God, when writing his gospel. Who are these women and what can we learn from them? Don't you just love how God shows His love for us as women?! 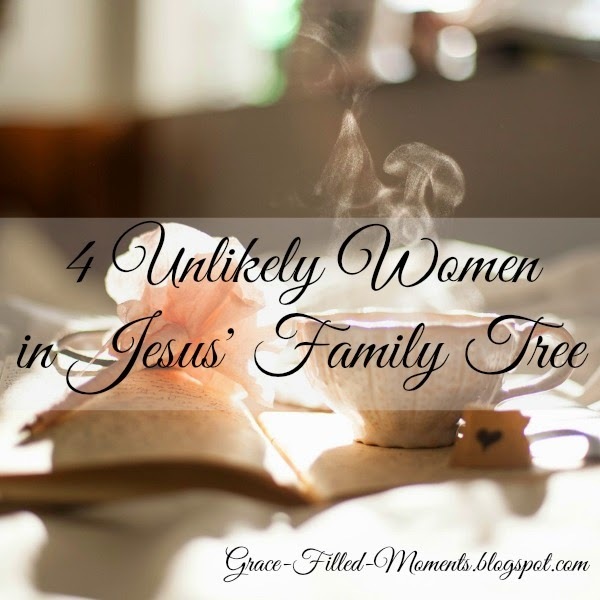 In ancient genealogies, women were not usually included, yet here in the book of Matthew we find not one, but FOUR women in the genealogy of Jesus! Tamar sold herself as a prostitute to her unknowing father-in-law, Judah, and birthed Perez and Zerah. Rahab was a Gentile prostitute who was saved by God from judgement and a lifestyle of prostitution. Ruth was a Gentile Moabite. She is one of my most favorite women of the Bible! You can read more about Ruth in my R is for Ruth post I recently wrote for my Women of the Bible series. Bathsheba's sin of adultery with David is implied with this reference "her who had been the wife of Uriah" instead of using her name. Find out what we can learn from Bathsheba's life in my B is for Bathsheba post I recently wrote for my Women of the Bible series. Right from the start of his Gospel, Matthew presents Jesus as Messiah and does so by proving the royal line that comes through David in his genealogy list. Proof that God can turn any MESS of our life into a MESSAGE! 2 Abraham begot Isaac, Isaac begot Jacob, and Jacob begot Judah and his brothers. 3 Judah begot Perez and Zerah by Tamar, Perez begot Hezron, and Hezron begot Ram. 4 Ram begot Amminadab, Amminadab begot Nahshon, and Nahshon begot Salmon. 5 Salmon begot Boaz by Rahab, Boaz begot Obed by Ruth, Obed begot Jesse, 6 and Jesse begot David the king. David the king begot Solomon by her who had been the wife of Uriah. 7 Solomon begot Rehoboam, Rehoboam begot Abijah, and Abijah begot Asa. 8 Asa begot Jehoshaphat, Jehoshaphat begot Joram, and Joram begot Uzziah. 9 Uzziah begot Jotham, Jotham begot Ahaz, and Ahaz begot Hezekiah. 10 Hezekiah begot Manasseh, Manasseh begot Amon, and Amon begot Josiah. 11 Josiah begot Jeconiah and his brothers about the time they were carried away to Babylon. 12 And after they were brought to Babylon, Jeconiah begot Shealtiel, and Shealtiel begot Zerubbabel. 13 Zerubbabel begot Abiud, Abiud begot Eliakim, and Eliakim begot Azor. 14 Azor begot Zadok, Zadok begot Achim, and Achim begot Eliud. 15 Eliud begot Eleazar, Eleazar begot Matthan, and Matthan begot Jacob. 16 And Jacob begot Joseph the husband of Mary, of whom was born Jesus who is called Christ. 17 So all the generations from Abraham to David are fourteen generations, from David until the captivity in Babylon are fourteen generations, and from the captivity in Babylon until the Christ are fourteen generations. Observations: If anyone was going to be presented to the Jews as their Messiah, they would require proof of his royal line. The genealogy of Jesus is given by Matthew right at the start of his Gospel to prove Jesus’ right to Kingship, and as proof that He was the promised Messiah, by presenting the royal line of Jesus. This is just beautiful!! God knew exactly what He was doing when He planned the birth of Jesus! Both Mary and Jesus’ adoptive father, Joseph, passed on a royal blood line to Jesus! Matthew proves in this genealogy that Jesus is legally an heir to the throne of David. Here’s another reason why this is so amazing! Listed in the genealogy we see that Josiah begot Jeconiah, about the time they were carried away to Babylon, and the genealogy list continues Jeconiah begot Salathiel, etc., etc. Well, Jeconiah had a curse on him that is found in Jeremiah 22:30: “Thus says the Lord: ‘Write this man down as childless, a man who will not prosper in his days, a man who shall not prosper in his days; for none of his descendants shall prosper, sitting on the throne of David, and ruling anymore in Judah.’” None of Jeconiah’s offspring would ever sit on the throne of David! If Jesus had been the real son of Joseph, He would have never sat on the throne of David because of this curse. God’s plan of the virgin birth bypassed the actual blood line of Jeconiah to ensure that Jesus would be a legal heir to the throne of David. Application: God is in the details! He guarded every single detail of Jesus’ birth and life. He does the same for us. We can trust that God will work ALL things according to our GOOD! Kneel: Heavenly Father, thank You so much for Your attention to details. Help us to never overlook anything that You have told us in Your Word. You have a reason for everything that You have included in the Bible. There are reasons why You move they way You choose to move. Help us, Father, to pay attention to the details You give us in Your Word. Open our eyes to behold wondrous truths from the book of Matthew as we commit to read it chapter by chapter. Give us eyes to see and ears to hear what the Spirit of the Lord has to say to us today. In the name of Jesus – the King of all kings – I pray. Amen! Thank you, friends, for joining me in reading the book of Matthew. What a wonderful way to prepare our hearts for Easter! I'll see you back here on Wednesday for another Blogging Through the Bible post! ***In my Women of the Bible series, I focused on one woman of the Bible for every letter of the alphabet. You can read all of those posts filed under Women of the Bible. 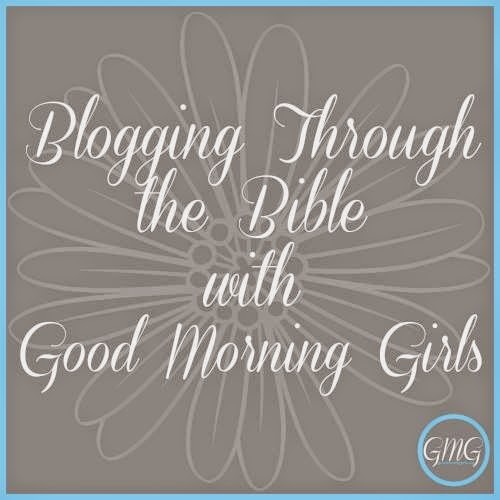 I'm linking up every Friday with Courtney Joseph over at Women Living Well, home of Good Morning Girls for Blogging Through the Bible. Click on the image below to read Courtney's post as well as others who are BTTB. Hi, Amy! Yes, Ruth is such a wonderful example! So glad you enjoyed this and shared with me here in the comments. I recognized this while reading Matthew 1-5 this week too!! I realized even more how merciful God is to use these flawed women to be in the same family line as Christ Himself!